The final of the 66th Japan Collegiate Baseball Championships was played at Meiji Jingu Stadium on June 11th, 2017 and Rikkyo University (a.k.a. Saint Paul’s University) of Tokyo Big6 League beat International Budo University (Chiba Prefecture University BBL) 9-2 to capture their first crown in 59 years. 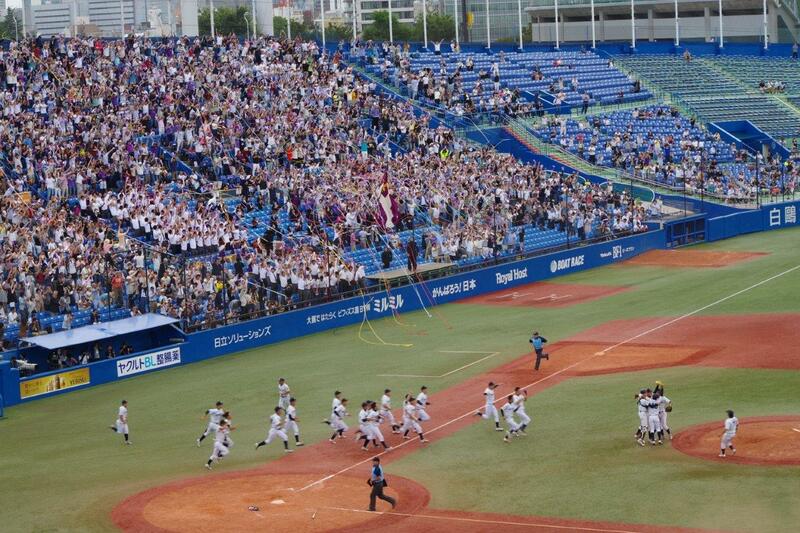 27 Regional Champions of University Baseball Teams in Japan joined in the elimination tournament at Tokyo Dome and Meiji Jingu Stadium for 7 days from June 5 to 11, 2017. Legend Shigeo NAGASHIMA (81) who is the Tokyo Yomiuri Giants' honorary manager for life visited the stadium by overcoming partial paralysis to the delight of crowd in the stand, and cheered for his alma mater. It was in 1958 when NAGASHIMA was playing with Rikkyo University to have won the national championship last. Kosuke OHIGASHI of Rikkyo awarded MVP, followed by Leading Hitter .467 Rikuya AKAKI of Budo, Best Pitcher 0.00 Hayate NAKAGAWA of Rikkyo, Fighting Spirit Prize Eito ISOAMI of Budo and Special Award went to Tokai University Hokkaido Team. All-Japan University Baseball Association announced 24 roster for 41st U.S.-Japan Intercollegiate Championship in U.S.A. in July, 2017 and 22 players out of the roster will also play at the 19th Universiade in Taiwan in August, 2017.